Sometimes, the politician in Charlie Gandy still comes out. “Hi, I’m the bike guy,” he introduced himself to other cyclists, pedestrians, people at cafes or whoever happened to be at hand while I was taking pictures or doing an interview during my visits to Long Beach this summer. “The bike guy” was hired by the City of Long Beach’s transportation program manager Sumire Gant in early 2009, with funds from a Los Angeles County Public Health Grant known as the Policies for Livable and Active Communities and the Environment (PLACE) Grants that Long Beach won in 2008. The grants were given to five cities to improve their planning documents to make the connection between promoting active transportation options and the health of the surrounding communities. Most of the grantees used their funds to create long and impressive planning documents. While Long Beach has produced its own planning documents as part of the grant (more on that tomorrow), the major impact of the city’s grant is the addition of the “bike guy” who sells the city’s bike projects to residents, visitors, reporters and the state and federal officials who fund the projects with a steady demeanor and seeming ease. “Long Beach is what happens when middle-aged athletes are put in charge,” Gandy joked when asked about the changes the city’s infrastructure was undergoing. In 2009, the city needed all the athletic help it could get. Census figures from 2005-2009 show that nearly one quarter of school age children (22.4%) in Long Beach were obese and the number of people commuting by bicycle (.9%), walking (2.7%) or by public transit (7.2%) were in line with the city’s sprawling neighbor to the north. There are many reasons why using census data to look at transportation usage can be misleading, minorities are under-represented, and the statistics look only at commuting trips and not recreational trips, trips to the store, or church, or the dry cleaners, etc. But for comparison purposes, Portland’s commuting mode share for active transportation options were much higher for the same period. 12.4% of respondents commuted by transit, 5.1% walked and 5.9% rode their bicycles. Enter Charlie Gandy, and things began to change. 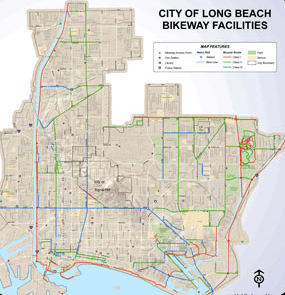 By October of 2009, Long Beach had moved aggressively on some ground-breaking bicycle projects, high profile traffic calming, and even some road diets. 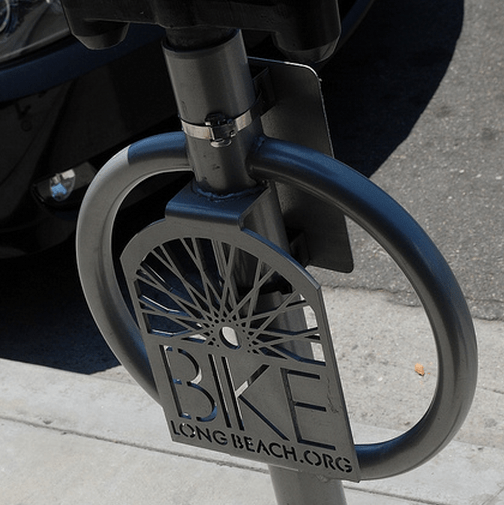 Writing for Streetsblog, former Long Beach resident Joe Linton, who co-founded the Los Angeles County Bicycle Coalition two years after moving to Los Angeles in 1998, wrote approvingly about what was already happening in Long Beach. This is not to say that everything that’s happening is one man’s doing. Gant was responsible for the city’s grant writing for transportation, and she’s brought in an impressive $12 million for active transportation projects. Allan Crawford is the program manager for the bike program, April Economides is working on the Bicycle Friendly Business District Program and Georgria Case is working on the “Share our Streets” Campaign. While Gant may have moved on, her team continues to push the envelope on Long Beach. But, for better or worse, Charlie Gandy has become the face of Long Beach’s Livability efforts, and it was Gandy who took me for a pair of bike rides throughout the city. The day before Streetsblog published Linton’s article in 2009, a traffic calming plan in the downtown business district was put into place. The plan made it easier for pedestrians to cross the street with better crosswalks, dramatically increased the bike parking in the area through a bike corral (where a car parking space is converted to hold 12-14 bicycles) and, by “bumping out” the curb, slowed traffic down and created patio space for the local cafe, aptly named Utopia. On my follow-up visit to Long Beach, Gandy talked up this bike stunt team from the Bay Area while I talked to the staff at Common Grounds. Just under two years later, Gandy and I stood in the same corral at the at the corner of 1st Street and Linden Avenue in Downtown Long Beach. While I readied my camera for a photo op, Gandy asked a half dozen adult cyclists who were unchaining their bikes if they had ever considered biking to “this part of town” before 2009. Not a single person raised their hands. Why? The group consensus was that before the traffic was slowed down and the bike racks put in, they hadn’t thought of the area as an inviting place to go for a weekend bike ride. And what’s good for bikes is often times good for pedestrians. Gandy struck up a conversation with a mother and father pushing a stroller while I took pictures of the separated bike paths on 3rd Street. Even though they haven’t ridden a bike in years, they loved the lane. Why? Because it got all the bikes off the sidewalk. “I used to see bikes on the sidewalk everyday on 3rd. I haven’t seen one in months,” the father smiled while pushing the stroller. Waiting for a green light on 3rd Street. The separated bike paths on 3rd and Broadway through Downtown Long Beach are the crown jewel of Long Beach’s bike infrastructure. With a physical barrier separating the lanes from traffic, the lanes are considered to be the safest type of cycling infrastructure one can place on a street. 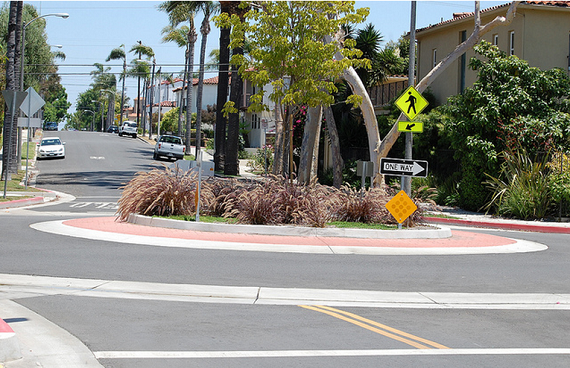 The Achilles’ heal of separated bike paths is the intersection crossings, but Long Beach addresses that issue with giving cyclists their own traffic signals so that motorized traffic won’t cross into the lane at intersections until after bicycles have a chance to cross. Another feature of the lanes is that because they are both on one-way streets, the lanes could be built on the left side of the road. This reduces interactions with buses, which can be terrifying for novice cyclists even in safe conditions, and reduces interactions with turning automobiles even further. Even on one-way streets, drivers are more likely to give a second look behind them when turning left than they are turning right. The separated bike paths are the first of their kind in Southern California, and while hard data isn’t available on usage as the lanes were only opened earlier this year, the city reports zero bike-related crashes in the two miles of separated paths and they have received rave reviews from cyclists around the country. The buzz has been so good, that Temple City is planning some separated paths of its own, and that city didn’t even have a Bike Plan last year at this time. But we do have some more firm data on the “Green Sharrow” Lane on 2nd Ave in Belmont Shore. Usually when a city puts colored paint on the street, they’re doing it in bike lanes, separated or otherwise, to denote their status. Long Beach added Shared Lane Markings known as “Sharrows” to 2nd Avenue to denote that the road is for all users. Then they painted the part of the street that is safest for cyclists, in the right hand lane but far enough from the curb so that parked cars and open doors won’t create safety problems, with green paint. The lane wasn’t without controversy, at least at first. While trying to interview Gandy about the lane, videographer Russ Roca was interrupted by a dedicated car driver who was angry about the lane. As Gandy calmly explained that the paint doesn’t change the law or the ability of cars to use the lane, the man’s face returned to it’s normal shade of color although he still seemed disgruntled about the change. While bike ridership on the street doubled in the first year of the program, data for the second year is coming soon, but cyclists and businesses along the route predict the numbers will be even higher from May 2010 to May 2011. Despite the gain for non-motorized users, the number of cars on the street hasn’t changed. Bike ridership has increased to 1,500 bikes per day, but car ridership has held steady at numbers quite a bit higher than that ranging between 35,000 and 40,000 cars per day. When asked about the cost for the project, Gandy informed me that it cost $5,000 to install and another $5,000 to touch up twice. In Long Beach, the labor costs of a project aren’t included in the total cost because staff hours are a fixed cost and they don’t have to pay overtime to complete bicycle projects. This is one reason that the city has brought in over $12 million in state, federal, and county grants over those years for active transportation projects. Another Long Beach first is it’s Vista Street Bike Boulevard. The city took a residential street, added traffic calming, traffic circles, bump outs, and signage encouraging bicycling. The street runs for one and a half miles, and the boulevard is insanely popular with the residents who love that the number of cars cutting through the street has dropped off dramatically. The Boulevard is also the first of its kind in L.A. County. There are two given reasons why Long Beach is able to race ahead when it comes to progressive planning while some other cities tend to stumble along. The first is a geographic reason. Because of its location, Long Beach sees less cut through traffic which places less strain on the city. “Being on the edge of the grid gives us an advantage. We don’t have all the people coming through our city’s like L.A. does, but our streets are designed to the same standards. That gives us a lot of space to work with,” Gandy explains. The second reason comes from building coalitions and how items are explained to the community. Residents and business along 3rd and Broadway heard about the benefits of calming traffic and increasing business. As Gandy put it, the diet and separated lanes were about creating an orderly street. To fight against it would be to take the side of chaos. In Belmont Shores where the Green Sharrow went down, businesses were shown statistics about how bike riders were more likely to stop and shop than car drivers. And on Vista Street, there wasn’t a discussion about increasing the number of bikes on the road, although residents knew that was a near guaranteed outcome, but about how the road would become a safer place to be outside, for kids to walk to school and a cleaner place to be outside. However, the selection of Vista Street for the Boulevard highlights one of the few complaints I heard while researching this street. All of these innoavtive projects, and some of the road diets that are happening around the city, are occurring in the most well-to-do and business districts. “Giving the best to those who need it least,” one critic who asked not to be named put it. But neither Gandy nor anyone in the City runs away from that claim. They claim that the city went to the areas that were clamoring for better streets first, because the demand already existed. Once these areas proved the success of these innovations, they could move on to other areas of the city. “When you build demand, you start with the early adopters, the neighborhoods that get it and want to go first,” Gandy explained. Long Beach is funded for 15 miles of bike boulevards, and the next 13.5 miles of them are in minority and less well-to-do communities. We’ll examine the rest of their long and short term plans, and see what impact it will have on all of Long Beach’s communities tomorrow. 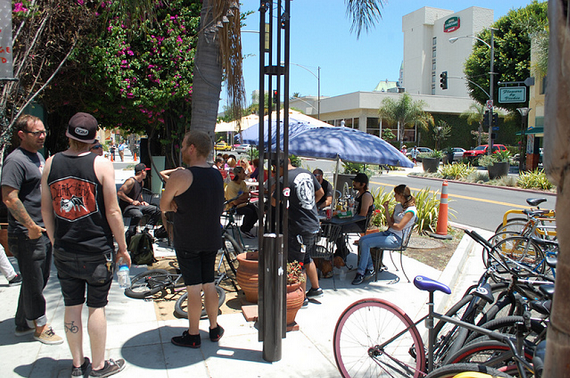 Perhaps the best endorsement of the change that’s happening in Long Beach is best summed up by April Economides, who manages the Bike Friendly Business District program discussed yesterday. 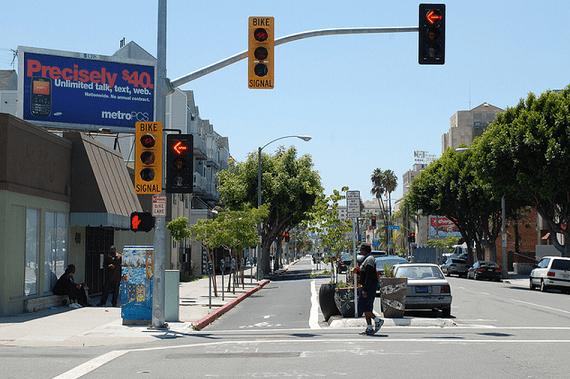 The car-free Economides moved to San Francisco, but returned to her hometown of Long Beach recently because of the changes that were happening. “All the infrastructure, sustainability and progress that has happened is the only reason I moved back here. I can raise my daughter in the kind of city I always wanted to live in.”Damien Newton wrote this story while participating in The California Endowment Health Journalism Fellowships, a program of USC’s Annenberg School for Communication & Journalism. To refer to the segregated bicycle facilities along 3rd Street and elsewhere in Long Beach as “bike lanes” is not correct; technically, they are bicycle paths adjacent to streets–note carefully the “BIKE PATH” signs at the entrances. (Separated bike lanes, as such, remain unlawful in California because they violate the minimum safety design criteria in Chapter 1000 of the Caltrans Highway Design Manual, made mandatory for local agencies by section 891 of the Streets and Highways Code. )While it’s true that conflicts between bicycle path users and traffic at intersections have been partially mitigated by dedicated signals and phasing, the true Achilles heel for sidepaths such as these is found at the driveway crossings, where the sight lines are less favorable, particularly if there is on-street parking, and turning motorists are less likely to be looking for bicycles or other conflicts. The presence of these conflicts is an important difference between the bicycle paths in Long Beach and similar facilities elsewhere. Right, because they don’t have driveways in the Netherlands… or do they? I rode the Vista Bike Blvd recently and loved it! I can’t wait to see similar bike blvds. in Los Angeles. Go Long Beach! Lead the way and we will follow. I love, love the Vista street improvements. I hear they are going to do it on 6th Street next. I want to move to one of those streets since the traffic is MUCH calmer and the circles are quite beautiful.